Wow, Did We Have Fun at the BIKESKILLS World Class! 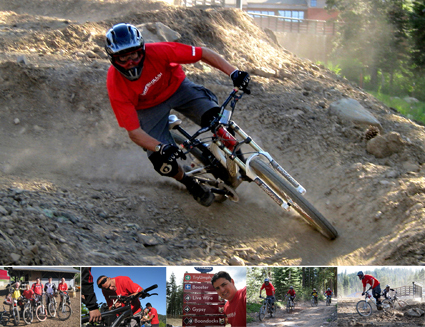 Register NOW for the The Mountain Biking Instructional Event of the Year! Join the world’s best cyclists, including world champions Steve Peat, Greg Minnaar, Leigh Donovan and Joe Lawwill along with Cedric Gracia, Crankworx winners Cameron Zink and Jamie Goldman. We’ll be offering an array of clinics ranging from Slopestyle, Downhill, Women’s Only, as well as our basic Trail Riding clinics this coming 24-26 September at Northstar at Lake Tahoe. Truly, World Class. Read on for more details and sign-up information. Whether you need to learn: the basics of trail riding, an introduction to the basics of lift accessed mountain biking, to take your downhill skills to the next level, or are interested in the basics of bike park riding, Tahoe and Northstar’s red-hot local and Bikeskills instructor, Karl Rogne can take you there. Check out the schedule for dates, times, and clinic descriptions.